My friend Sara sent me a package out-of-the-blue (talk about making my week!) and included this little book for my reading pleasure. 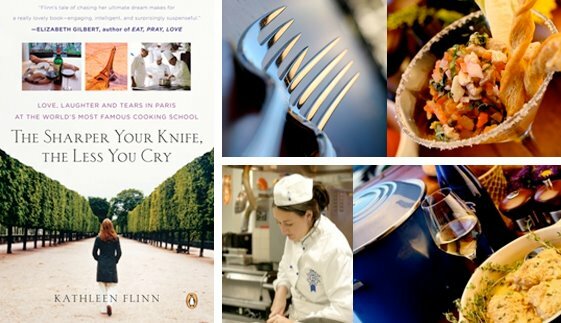 The book details a woman's move from corporate life in the States (and UK), to student life in Paris--at Le Cordon Bleu nonetheless. I found it very interesting as I've always been fascinated with the idea of cooking school, especially at Le Cordon Bleu. If you've ever been curious yourself, you should add it to your reading list. She includes many delicious-looking recipes and includes a bit of romance as well. I appreciated the way the book was organized in a way that allowed me to take in small doses of her experience (all my mommy-of-3 lifestyle allows these days) in an enjoyable way. that sounds like my kind of book! Thanks! This looks lovely. The idea of attempting a new life is so wonderful. Jane from This Week For Dinner read this awhile ago and loved it. I've been thinking about it ever since. I read it and it is great. Not only you feel like you are in Paris, but the food in my kitchen tasted better too. Enjoy!! i liked that book a lot. the idea of moving to paris is always on my mind. Good call! I've always wanted to go there. Love your blog!